The highway passes quickly through Summerville, Georgia. The roadsides fill with small houses, businesses, and the ghosts of fastfood architecture. It is easy to miss the turn to Paradise Gardens. The houses that surround Howard Finster’s home, installation, and “life’s work” part suddenly to reveal the expansive sculpture gardens, rambling buildings, and layer cake tower of the World’s Folk Art Church. It is easy to think we know Howard Finster, “man of visions.” His paintings grace the covers of pop albums. His portraits and hand painted words fit into our perceptions of an outsider artist. He was outside enough to be embraced by the art world and savvy enough to know how to eat up the celebrity that came along with it. Paradise Gardens is empty, as I arrive. I talk to the attendant about the slowly unfolding and changing history of Paradise Gardens, hear his stories of coming to visit on a school field trip and being told to return to church on Sunday afternoons while peeking through the fences at Finster working. As recommended, I start at the back corner, and, before I get there, my preconceptions of Finster fall away. 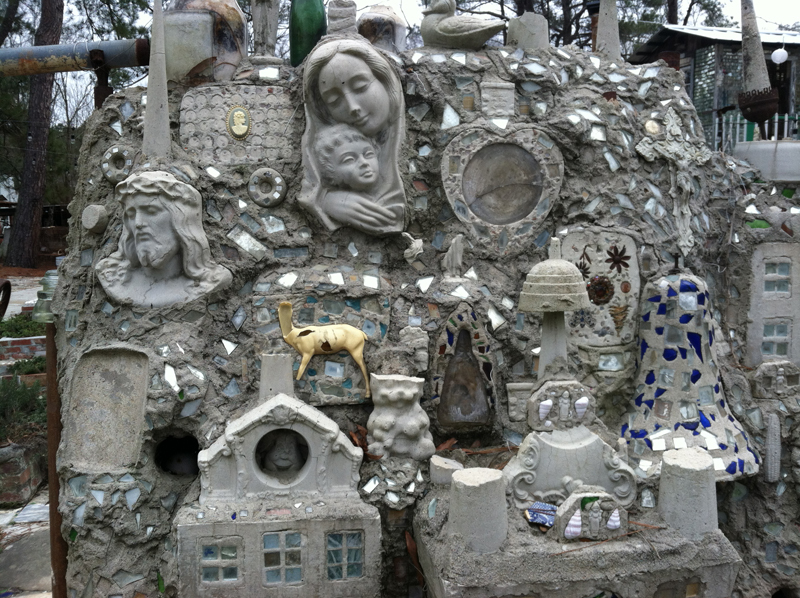 Paradise Gardens is a stubborn refusal of the outside world that embraced his artwork and public persona. It resists visual and economic consumption. It arises from an unassuming, largely poor, small Southern town that, at best, tolerated his work during and after his lifetime. 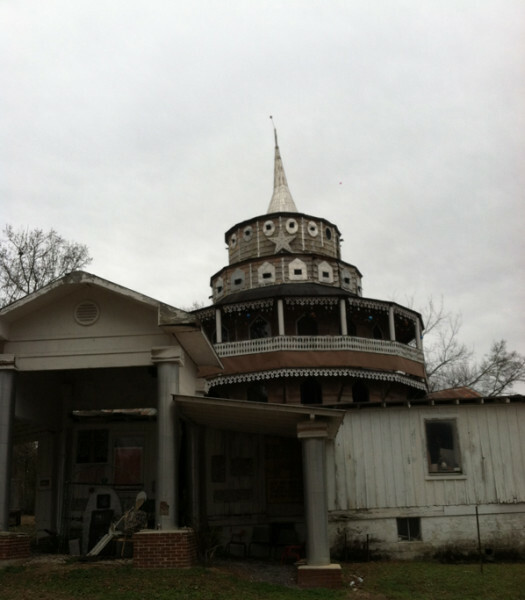 The World’s Folk Art Church, the most striking and visually alluring building, has been closed for decades due to structural concerns. The work of other artists and admirers intermixed with Finster’s work blurs lines of authorship and individuality. 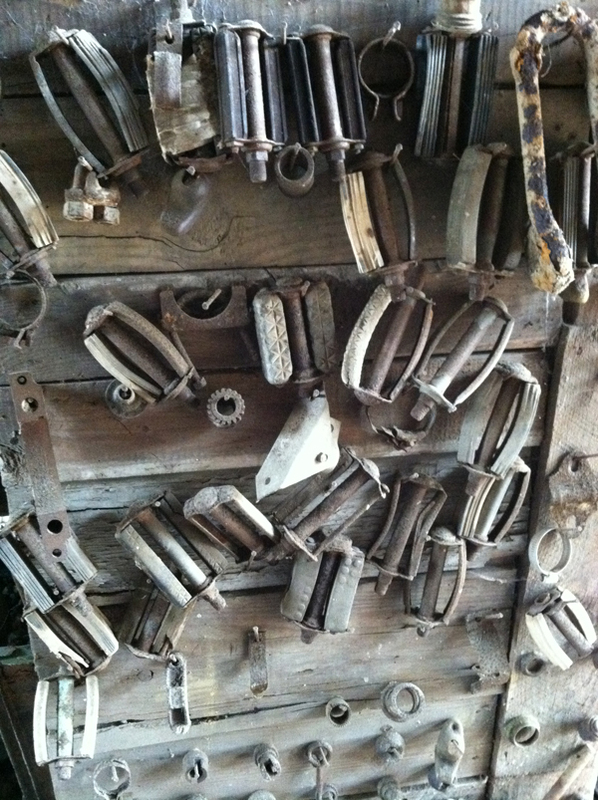 Paradise Gardens is full of beauty and wonder, but it is also full of Finster’s enormous collections of the “inventions of mankind” that, under different circumstances, would be called hoarding. Life and death comfortably coexist in Paradise Gardens. The area surrounding Paradise Gardens abounds in life. Workers repair the sewer outside the fence. 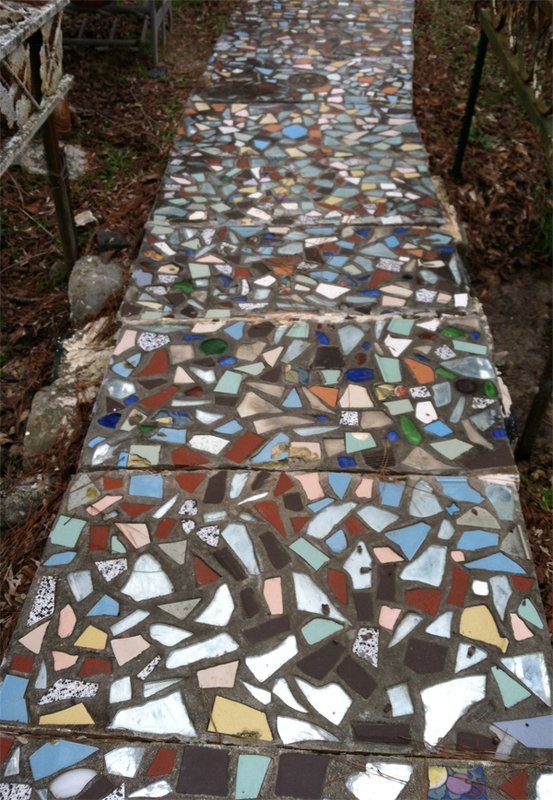 Neighbors come and go without giving Finster’s Mosaic Garden and paths a second glance. The Casket of the Unknown Body, which used to have a viewing glass so visitors could see the girl’s teeth, the constant reminders of the Christian life after death, and the many memorials to Finster embody and keep death present. The many collections of bicycle parts, sewing machines, typewriters, Coke bottles, and more hold the lives of the people who made them and the man who placed them. They cast shadows of their original uses as they hang lifeless. The bicycles, televisions, and scraps writhing up out of the weathered, increasingly uniform mass in the center of the garden are transfigured into the Bicycle Tower and reborn into pop careers. I recently visited an old bakery-turned-warehouse filled with tens of thousands of plates, saucers, coffee cups, teapots, ramekins, the remnants of restaurants closed in the ‘50’s, ‘60’s, and ‘70’s. The stacks and stacks of plates filling the warehouse were caked in dirt, filled with rainwater, surrounded by pigeon droppings. 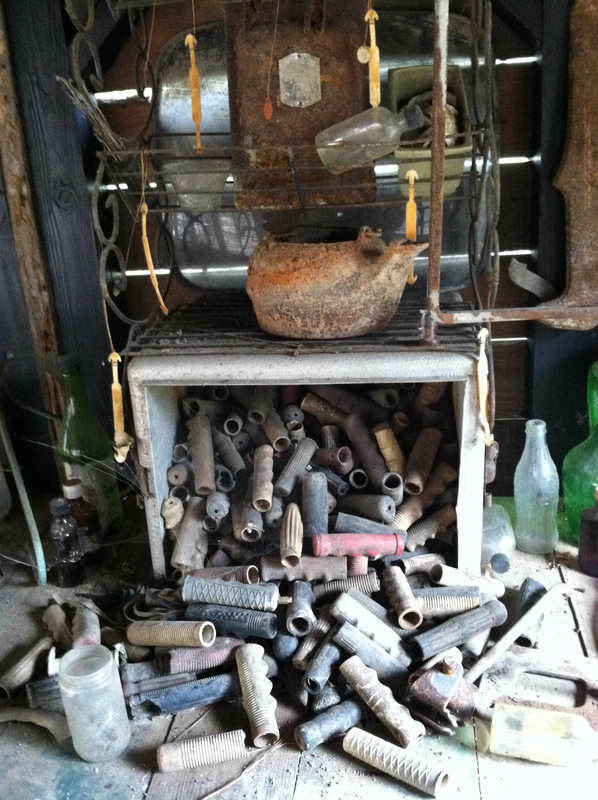 They are a treasure trove and a filthy testament to objects. They are the left overs of failed businesses and abandoned identities and the china that holds the memories of a generation of Americans who ate at roadside diners and fraternal order lodges. Like Paradise Gardens, this warehouse full of dishes straddles the line between collecting and hoarding, between objects and memories, between life that ends and death that continues. Life and death are so deeply intertwined they are indistinguishable from one another. I just moved to a new town, a new climate, a new part of the country that has much to teach me. I cannot help but think of making a new life, of reshaping my inward and outward habits in conjunction with the physical move. Both Paradise Gardens and the warehouse remind me that the life we have is short, that the death that awaits us is not far. More importantly, they help me hold close the fact that life begins again and again, when we move to a new place, when we wake each morning, when death comes to find us. Finster believed in a very specific idea of life after death. Whether or not we ascribe to that belief, Paradise Gardens confronts us with death and the lives that come after. It is well worth the trip. Eric Asboe is an artist, writer, and cultural worker. Asboe's creative works prioritize process over product and explore the boundary between practice as improvement and practice as way of life. He lives and works in the Southeast.